Hearts have confirmed that a "small number of senior players" will not receive wages that were due to be paid on Monday. It is believed that it is a result of a cashflow issue at the Scottish Premier League club. All 12 top-flight clubs have still to receive about £300,000 each from the the SPL. This, along with some other moneys due to the Edinburgh outfit, is being blamed for the latest problem. 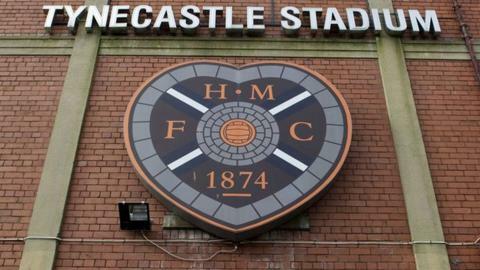 Hearts said in a website statement that a "vast majority of its 45-man squad" had been paid their salaries in full and that those who had not "will be paid shortly". "We have apologised to the small number of players affected by this short-term delay to their wage payments and we are grateful for their understanding on the matter," said a club spokesman. "We expect the matter to be resolved once we receive a guaranteed income expected in the very near future." Hearts' league governing body last season charged the club "with failing to behave with the utmost good faith to the SPL" after they were late in paying their players.